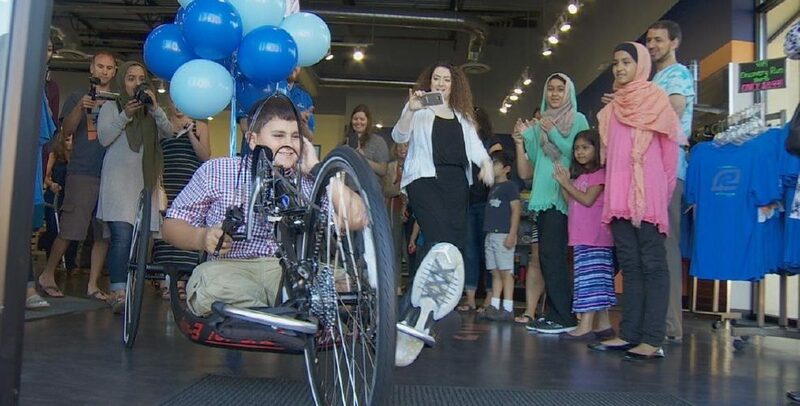 The awesome folks at our Tualatin Road Runner Sports store in Oregon had the honor of changing the life of an 11-year-old boy from Gaza last weekend. Thaer was at Shriner’s Hospital in Oregon to get fitted for a prosthetic leg. Two years ago his family’s home was hit by a drone strike and not only did he lose his leg and part of his hand, he also lost his mom and four siblings. Giving him a free handcycle may seem trivial compared to his losses, but at least it put a smile on his face for a few minutes. Thank you to Reid and his entire team for welcoming our 1,147th family member in style. Look what we get to do! Athletes Helping Athletes is the in-house charity of Road Runner Sports. Their mission is to gift handcycles 100% free to children with disabilities helping them gain confidence, build strength, and go fast with family and friends! AHA is staffed solely by volunteering employees of Road Runner Sports…like me! Next Next Can Ya Just Leave The Canyon Alone?